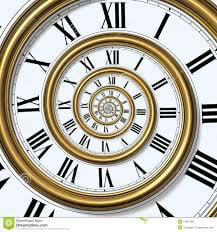 So if time isn't linear and no polarity exists in our true reality, (beginning or end), past, present or future. What is it that we should be experiencing ? The moment of 'NOW' is all we have. Our experiences are moment by moment fragments of now. If you want to reflect on this, and think about now moments that have already been experienced (memories) we need to view this in a manner of a construct which is a spiral shape, which can stretch and constantina out meeting other moments of now.... what we would term past and future lifes, are all happening simultaneously in this moment of now, so are therefore actually parallel lifes that are all happening at this moment of now..... This is the mind blowing bit, and the mind will not comprehend it, so don't worry about that currently. As we individually expand our awareness, our individual reality will seem to grow, it doesn't actually grow it is our awareness that becomes bigger allowing us to experience more. This process is something you need to experience for yourself, and it's something that you can do and access right now. Intention, stillness, meditation are all useful tools to use, or indeed you may have your own way of doing this. But please don't feel inferior of any one else, for you are exactly where you need to be in this precious moment of now. No other is more or less superior. For we are individuals, but interconnected to the whole, so how can they be any hierarchical structure. So why look to others, I am slowly learning the answer to this, for I was one who would happily give my power to others for a fair trade of their wisdom. But I am coming to the realisation that no other can truly do that, sure they can share their wisdom for their journey, but it may not be your truth or indeed your path. If however, you feel guided or connected to other souls and their wisdom, if it is offered in a manner of facilitating your process or empowering you to see your own truth and it resonates deeply in your heart, then I would say you would be wise to take it. But on the other hand if it is offered and it feels like it's being given to you in a didactic manner 'this is the way I do it and the only way, and look where I am now', I would feel into it, and if it doesn't resonate I would politely decline. You will know and here is where you need to trust your intuition, your souls knowing, there are some beautiful soul light houses out there illuminating the path for others and your soul will know how to recognise them. Again, this goes to all the material, including this one and others I share, I share with you all that resonates with me on a number of levels.... but not all may resonate with you, take what does and anything that generates any type of fear it is a clear indicated that it's not for you.